Those of you planning to pick up your copy of Madden NFL 09 at your local Sam's Club may be in for a bit more value than the usual discounted prices. An official for the warehouse store dropped us a line this morning to let us know that Sam's Club locations with photo centers will print out a high-quality version of the updated packaging featuring Brett Favre in his dashing New York Jets uniform, which we revealed to you last night, right inside the store upon purchase of the game. Sure, you could head over to EA's Madden 09 site and download your own, but getting other people to do things for us is one of the principles that America was founded on. 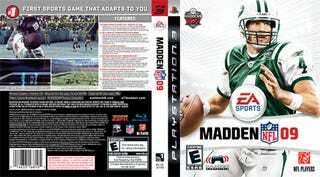 First Look At New Brett Favre Madden Jets Cover! We checked out Sam's prices for the games after receiving the news, and they do offer a nice little discount. The PS3 and Xbox 360 version are going for $55.55 ($83.22 for the collector's edition), with the PS2 and PSP versions marked at $36.33, the Wii version at $46.66, and the DS version a bargain at $26.66. All this plus a free cover replacement while you wait? None too shabby. Update - Just got word from Walmart that they'll be printing covers on-site as well, though the games are regular price and you don't get a Walmart card with your picture on it - that's reserved for managers.